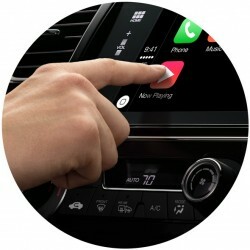 While Toyota has long been listed as one of Apple's CarPlay partners, the third best-selling auto brand in the U.S. currently has no plans to offer vehicles with the feature in that country, as noted in a New York Times overview of the race between Google and Apple to own the dashboard. Toyota also has no plans to offer Android Auto support in the U.S. While Toyota is ruling out the U.S. market for CarPlay support for the time being, the company has not made any firm announcement about support in other countries. Shortly after Apple's CarPlay announcement, Toyota's UK division briefly posted a blog entry claiming CarPlay would be coming in 2015, but the company quickly backtracked on the claim. Today's report from The New York Times focuses more on Android Auto than on CarPlay, likely due in large part to Apple refusal to comment for the piece. Still, it offers a glimpse of the struggles auto manufacturers have had developing in-car systems and their reluctance to turn that experience over to Apple and Google. With consumer preference driving the market, however, many manufacturers now see little choice but to support both CarPlay and Android Auto. Vehicles supporting both systems are expected to be hitting showrooms in the near future, with Hyundai likely one of the first out of the gate. "we prefer to use our in-house proprietary platforms"
Clearly not thinking about what the consumer wants. Fortunately, I've never had the urge to buy a car from that company. I never expected this from Toyota, but I guess they see it as a way of differentiating themselves. Too bad that will drive potential customers to other brands. I just can't see how their proprietary system could be better in any way. HUGE disappointment for those of us in the United States that are a fan of Toyota vehicles. While I'm not likely to get a new car for another 2-4 years, I sincerely hope they've changed their mind by then. If not, I might have to look to a different vehicle brand. I'm the type of person that holds onto their car for 10 years (if possible), so when I do make the move for my next vehicle (was hoping it would be Toyota again), I'll have to do a full evaluation. Carplay isn't everything and who knows, maybe it'll be something completely different than what it is today, but these are my current thoughts based on this news today. And when will everyone else realize touch screens and infotainment screens in general are dangerous in cars. Let me go ahead and scratch Toyota off my potential-next-car list. what car manufacturer wants to support Apple after all the Apple car rumors now?